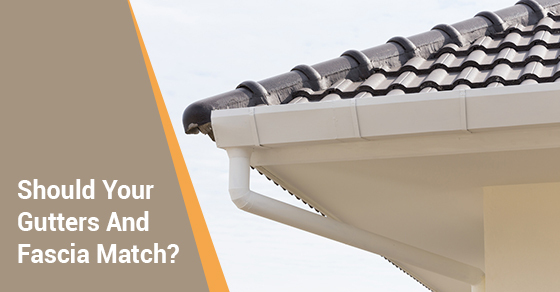 Should Your Gutters And Fascia Have The Same Look? especially if you are someone who likes to experiment and inject your own style and personality into your home’s theme. Your fascia sit right below your gutters, and while they are certainly not the make-or-break element of the exterior of your home, they contribute to its overall look, and are elements you want to get right. Many people wonder if it they should have their gutters match their fascia, or if they should have he same look for continuity’s sake. Most gutter installation services will tell you that it really depends on what your goal is, but below are some things to consider when pairing your gutters and your fascia. If you talk to a gutter installation company, they will most likely advise you to think of your fascia as the frame of your roof, separating it from the rest of your home. There are no real hard and fast rules as far as fascia are concerned, but many people like to go with traditional white because it is the cleanest look and provides a nice framing element to your roof. The most important question to answer is, what does the rest of the exterior of your home look like? If, by keeping your gutters and fascia identical, you are creating no contrast or framing look to your home, you might be advised to go with fascia and gutters that compliment (it’s important they don’t clash), but are not exactly identical. If you have white window sashes but a darker colour roof and paint, a white fascia might be a nice white addition to a predominantly darker coloured home. The bottom line is that fascia and gutters can match, but they don’t have to. What matters is that you are happy with the overall look of your home, and that you feel your home and roof have been framed adequately by the fascia, as that is what it is ultimately there for. Keep the above design considerations in mind, and ensure that your home looks well put together, whether your gutters and fascia match, or don’t.